Sue has a great Activities Team: there’s Jill Belcher, Assistant to the Activities Director, William Shelton, who heads setup/prep, and Jerry Colling and Tracy Gagnier, who run the kitchen. Plus, Sue passed along these photos of some of the volunteers who are regular contributors to the Activities Team. Pictured are just a few of the 100 and volunteers serving at an event. The kitchen serves at over 70 events throughout the year. Chef Jerry Colling and Head Volunteer Coordinator, Tracy Gagnier pictured on the left. Working on the Newsletter are volunteers from left to right: Jerry Byker, Esther Rusk, Judy Albright, Marjorie Byker and Richard Rusk. This team puts the inserts in the newsletter. Another team collates all inserts ahead of time. These gals cheerfully volunteer in The Activity Office. Pictured from left to right are: Back Row: Annette Viscomi, Marge Ranstrom, Lois Oberg, Nancy Swain, Sandy Kennedy, Linda Huss and Jill Belcher. Front Row: Sharon Beckett, Maxine Flentje, Marge Factor, Sue Arneson and Karilyn Martinsen. Not pictured are Ginny Wander and Cheryl Fowler. There are many more volunteers, but with limited space not everyone could be pictured. Currently the Activity Office is handing out the new Business Directories. Please come down and sign for yours. The Activity Office is where you purchase all your tickets, order the Az. Republic, buy stamps, “Lost and Found “and does copies and faxes. Jill types all the messages on Channel 6. 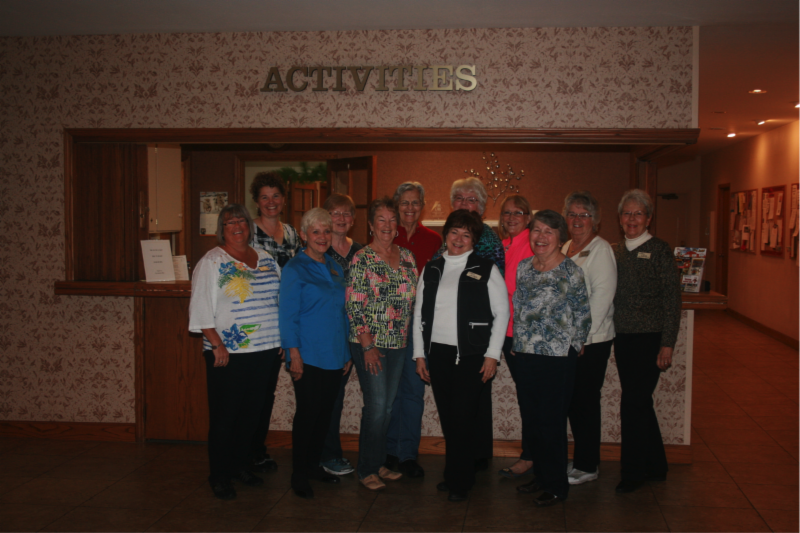 Sue is grateful for the many helpful hands that make the Activity Department run successfully!